How to run Kiwanis Park, Tempe AZ, scene of many major meets and now the host of the first Southwest Regional championships of the Nike Team Nationals cross country meet. Top two teams at the regional will qualify for the 4th Nike Team Nationals at Portland OR on December 1. I need to preface this article by saying that I have little experience on this particular course. 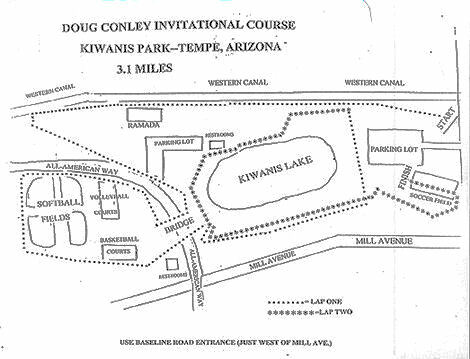 I have seen two races at Kiwanis Park; the 2004 and 2006 New Mexico/Arizona Border Wars. In 2004 I ran in the coaches/citizens race. You should also know that I coach runners to run even pace races and do not believe in charging out to the front of the pack. With that in mind I was surprised that most of the people that I talked to agreed with my opinions on Kiwanis Park. James Butler of Eldorado believes that, “the course is very deceptive. With a flat, straight, and firm first mile it is really easy to go out over your head. Then when you hit the soft grass with lots of hills and turns you pay the price.” When I ran in 2004 I paid that price when I circled around the lake. As I raced toward the hills my legs were trashed. I had pushed the pace through the mile and then made aggressive surges to keep with the pack as I circled the softball fields and had little left as I ascended the short steep hills that surround the lake. Prior to the race I had little or no respect for the course. When I was done my legs were burning, my chest was fine (I live at 7,000ft elevation) and I had a new found respect for this deceptive course. At about 1200 meters the runners will make a hard left and move onto the sidewalk that leads to “The Bridge.” The sidewalk that leads to the bridge is wide and passing can be accomplished easily but not as easily as on the dirt road. As runners get closer to the bridge they tend to jockey for position. They often wish to be at the front of small packs as they head for the tight right turn under the bridge. Runners will have to descend quickly off of the sidewalk and on to the grass trail that takes the runners under the bridge. They then re-emerge on the opposite side of the road where they will run up a short hill and continue on the grass trail. On the way up the short hill the runners will pass the 1st mile marker. The quickest section of the course is now behind the runners as they speed off into the most isolated section. Jim Walmsley (Horizon HS 2007 Doug Conley Champ and fastest Individual time at Mt SAC 2007) believes that this is a key area of the course: “The softball fields are a part of the course where you can start to make a move because of the grass. It can be a part where you can pull away and get ready for the hilly part of the course.” In this part of the course the runners will now venture off to an area where there will be little or no fans. During the 1st mile the Western Canal Road will be lined with fans who can easily jog over the hills and catch the runners as they scoot toward the first mile marker. Most of the fans will then either; remain by the bridge and wait for the runners to reappear or they will seek out a section of real-estate along the lake. The fleetest of fans and coaches will sprint to the Basketball courts so that they can view the action from afar. Reaching the southernmost section of the course is nearly impossible due to the fences surrounding the softball fields. For these reasons the runners will be in a very lonely and quiet place as the run around the Softball Fields. The distance around the fields is about a half mile. This will be a key point in the course as the runners are now running on slower turf and they lack the inspiration of fans and coaches to boost them along. As the runners reach the Basketball courts they will now begin to hear cheers and instructions again. At this point the runners are nearing the halfway point and the toughest section of the course. The course takes the runners under the bridge for a second time and sends them up a steep hill following a hard right hand turn. This hill is steep enough that many runners will move from side to side to attain the proper footing and momentum to ascend the hill. But this hill is short and the runners are now headed for a loud and interesting section of the course. Some people believe that the racing begins at this point. As Matt Tebo (ran Kiwanis in 2004 and 2006 and is currently at Colorado U.) states, "There aren't any really dangerous areas on the course. But halfway through there are two tough hills where the real racing will start. But being patient early on can solve a lot of problems that will usually come up late in the race." As the runners head for the loop around the lake they head toward the finish line. I have seen runners put in a surge here only to pay for it later. I believe that the runners' internal maps are telling them that they are almost home and they get a little anxious here. Plus runners are now surrounded by fans who are cheering them on for the first time since they passed the mile. As the runners head toward the lake they run along a side walk that is right next to the lake. I have wondered if any runner has ever taken a bad step and fallen in. Anyway the course now takes the runners back to the grass as they head to the section of hills. It is at this point that the runners must ascend Ramada Hill (about 40m) and go back up the 20m hill that they ascended before. These hills are not that daunting but their position at the end of the race gives them added teeth. From the top of the last hill to the finish line is about 800m. There are no more obstacles and the terrain is a mix of grass and side walk. There is one sharp right hand turn to the finish line that may cause some problems. In general, runners should pay special attention to the 4 sharp turns on the course and make sure that they are in the proper position before navigating the turns.